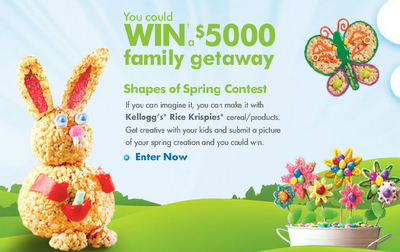 Spring is here #Kelloggers, $5000 family getaway!! The rain was teaming down this morning and what a better day then to have fun with the kids indoors by making some Rice Krispie treats! I know the children in my house love to bake and create treats out of the Rice Krispies and then eat them once they are all set up. The classic Rice Krispies treat is a great starting place. The easy to follow recipe can be made for decorating and creating anything your little one can imagine. Did you know Rice Krispies treats can even be made in the microwave? – so easy! Set yourself up with a recipe and piles of ingredients for each child. Put the ingredients into different bowls to make the scooping easy. Pull out bowls, spoons, measuring cups and let them do the scooping and stirring. As early as 2 years old, a child can stir and add. If they cook it, they will eat it. Let the kids experiment and add flax seed and other healthy ingredients to their cookies or bars. Let them test and taste – bring on the rewards. They will be most inclined to try a new granola or muffin or cookie right after they have had a hand in the cooking. Make squares or cookies ahead of time and then enlist the kids for the fun work of icing and decorating. Put out little bowls of icing, sparkles and candies and relax with the oven off and the knives put away.